In the open living and dining room of a hillside family home in Japan, Eames shell chairs surround a custom walnut table by Kagura. The upholstered seating is by Arflex. The architect, Masahiro Harada of Mount Fuji Architects Studio, also designed the custom kitchen island and stove vent. The architects designed a low structure that clings to the topography of its forested site. The wood flooring throughout the home is by Kodama. Most of the house is oriented toward the glass curtain wall overlooking the town of Odawara, save for private areas like the shared bathroom. Wood-fiber cement panels by Koa Funen line the interior, and the criss-crossing laminated veneer lumber beams are from Key-Tec. See-through dividers in the form of open bookshelves define the interior public spaces; the fiberboard planks are by Hokushin. The architects designed the steel-frame doors and windows, which were fabricated by Takeuchi Kozai. One summer day, Kensuke Kenmotsu stepped into his nine-month-old house and found a monkey standing in the laundry room. 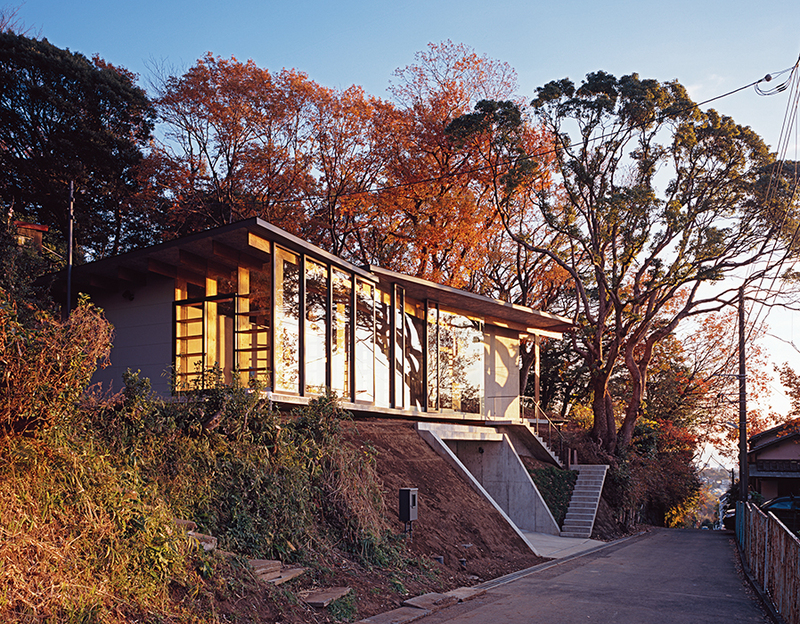 The airy single-story home hugs a wooded slope overlooking the city of Odawara and Sagami Bay. The monkey had walked out of a tangerine orchard adjacent to the house, slid open a screen door, and swaggered inside. “I think he was after our bananas,” says Kensuke, a construction labor contractor. His wife, Chika, who is terrified of monkeys, was not pleased. But for architect Masahiro Harada the story is the highest of compliments. “We’re all descended from forest-dwelling apes, and I think we’re still happiest living in places that feel a bit like a forest,” says Harada. “Rather than cut down the trees and build a box, what I wanted to do here was make something a monkey would appreciate.” The 41-year-old co-principal of Mount Fuji Architects Studio—along with his wife and partner, Mao—has achieved that goal in the sun-filled, south-facing home, for both visiting simians and the Kenmotsu family. A one-room plan—or as close to it as possible—was among the few requests the family of four brought to the Haradas after seeing the popular design team’s work in a magazine. The other request was plenty of bookshelves: Chika and Munehisa love to read (so do the architects, whose home designs often feature dramatic shelving). Left to their own devices, the Haradas began by getting a sense of the family’s lifestyle and carefully surveying the land. They built a model of the site and the mountain behind it and put it in their office, where Masahiro spent long nights playing with possible layouts. “Things want to be arranged in a certain way. 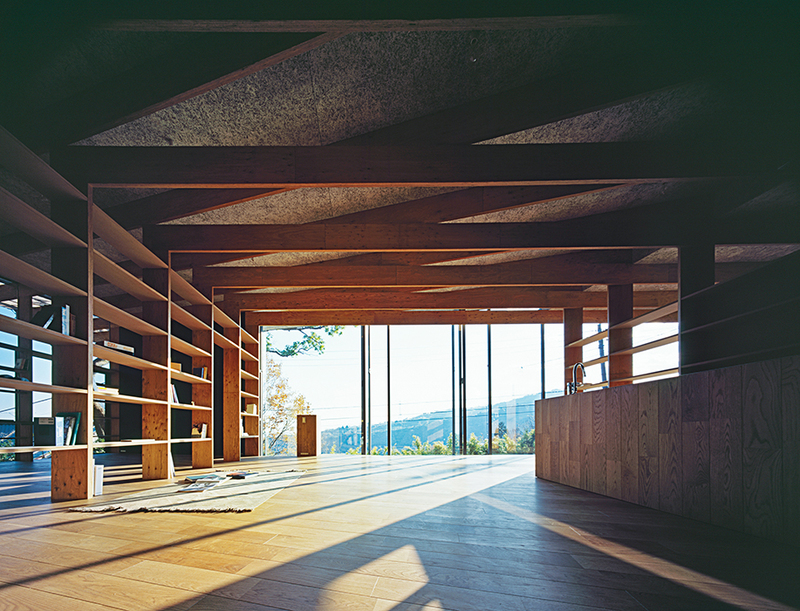 Design is about listening to those voices—interviewing the land and materials, so to speak,” Masahiro says. Eventually, he hit on a long, low structure that follows the curve of the uneven site. 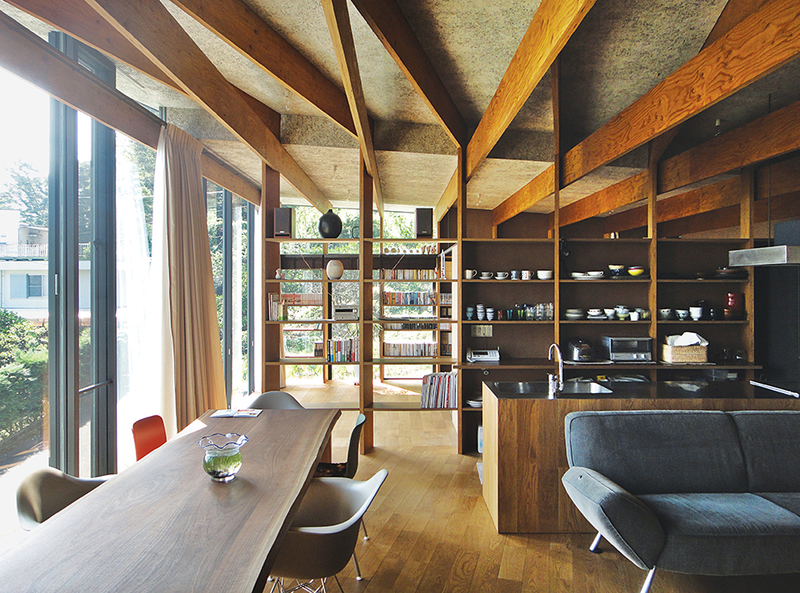 One set of exposed, laminated veneer lumber (LVL) beams extends partway across the ceiling, parallel to the hillside. Another set intersects them and continues along at a different angle, as the contour of the land dictates. The triangles formed where the beams cross transfer stress toward a rectangular “core” at the back of the building, providing enough stability to render solid walls between rooms unnecessary. Instead of walls, grid-like shelves, formed by placing fiberboard planks between rows of posts, partition the space. The result is geometric in the way of a Kandinsky painting: Sharp lines clarify rather than constrict the patches of light and color between them. In the way the angular structure slips easily into its natural setting, the 1,675-square-foot home evokes modern American design. The resemblance is unintentional. “We get our inspiration from fantasy novels and trips to the mountains, not architecture books,” Mao says. She does admit one link with her midcentury predecessors: a predilection for industrial materials used with artisanal care. The ceilings in the family’s home are finished with wood-fiber cement panels, commonly used to insulate factories and schools. The medium-density fiberboard remains unhidden and unpainted, used for walls, interior partitions, and shelving. Mao says she prefers raw materials because they age gracefully. In their office, holding up a sample of LVL, used for the house’s structural frame, the couple coos appreciatively. “It’s like mille-feuille pastry,” Masahiro says. The home that the architects shaped from those unassuming materials is elegant, but it’s also comfortable enough to pass muster with Munehisa. Standing sock-footed on the sun-warmed floor, the trees waving wildly through the windows behind him, he explains with a shy grin why he likes his new house: “It’s fun!” The monkeys, no doubt, would agree.